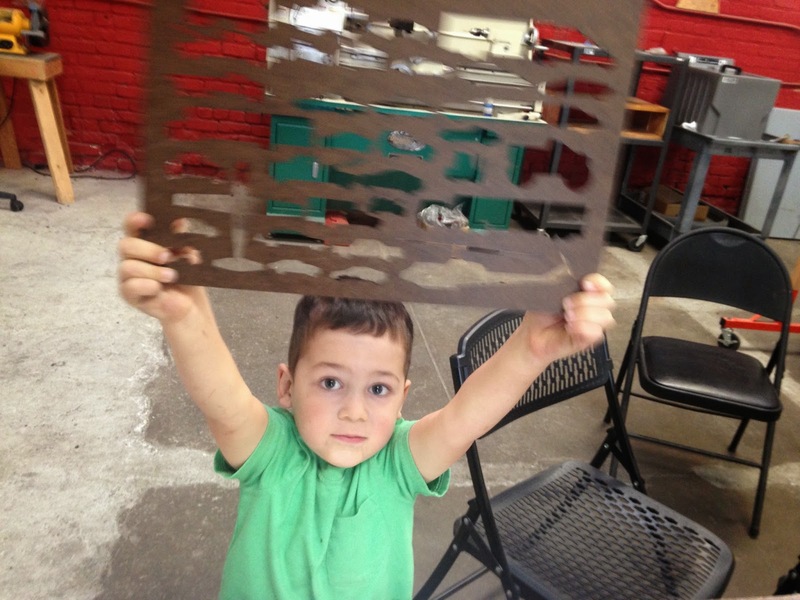 One of the perks of running a startup out of a maker space is that you can use the tools for other fun stuff as well. 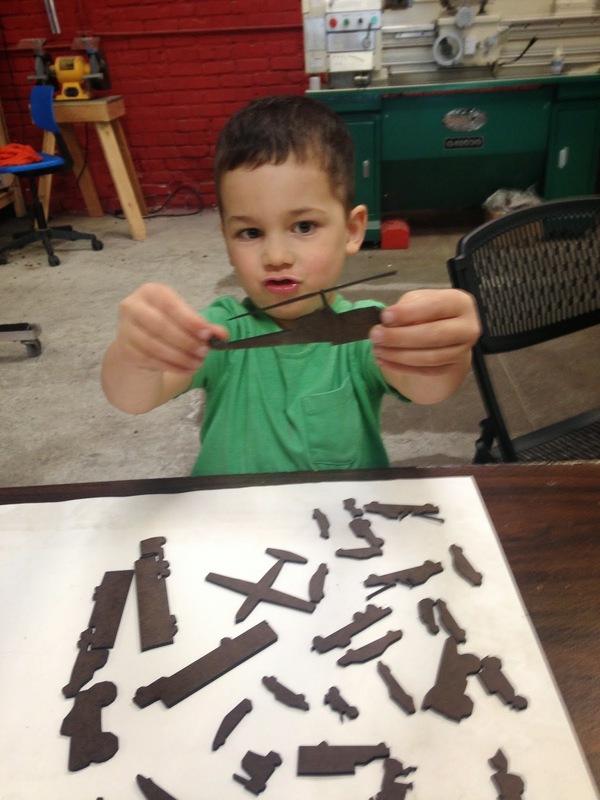 Last weekend, I took my son to the lab to make trucks with the laser cutter. Genghis is four and a half, and a huge fan of trucks and construction vehicles. 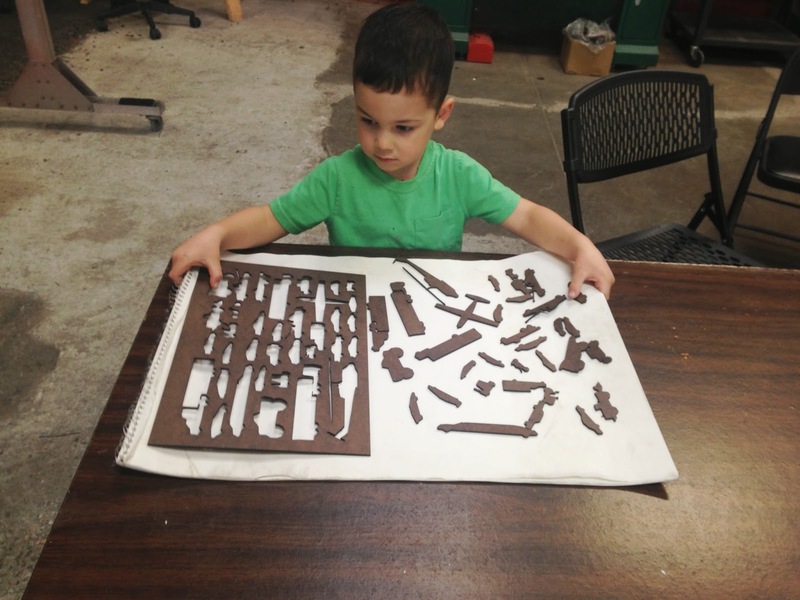 When he was two, he insisted on “Goodnight, Goodnight Construction Site” as bedtime reading. Every single day. For six months in a row. 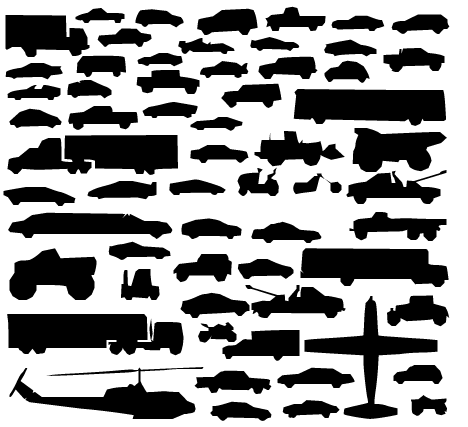 For this project, I found a stock vector file with silhouettes of several dozen vehicles. I used the Inkscape’s "trace bitmap” function to trace the edges. (For those of you following along at home, I’ve included my trace settings at the end of the post. They also worked well for rocket and dinosaur cutouts.) There was a watermark on part of the image, and some of the marked trucks didn’t trace very well, so I just deleted them and moved other trucks to fill the gaps. Then I saved it as an SVG. Next, I found this handy SVG-to-DXF converter and ran my file through it. DXF can be a finicky format, so I was pleasantly surprised when we got to the lab and the outlines loaded perfectly on the laser cutter software. 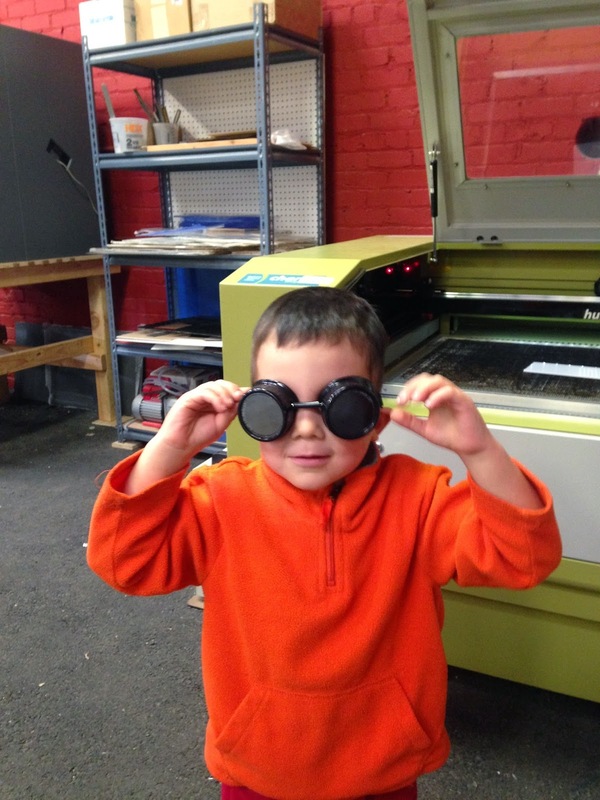 Genghis was excited to see the laser cutter in action, so we set him up with a pair of safety goggles. He loved them—was very reluctant to let me take a turn. My kid as Doctor Horrible. We cut the trucks out of spare eighth-inch hardboard from the lab. I also added a rectangular frame so that the whole thing would work as a kind of puzzle. After a few test cuts to get the sizing and laser settings right, we ran the whole trace. The cut itself took less than 5 minutes. Genghis danced the whole time, shouting the names of trucks as their outlines became clear. “It’s a helicopter! Now it’s a front-end loader!" The verdict: most of the trucks have held up very well. We lost one chopper-style motorcycle during the cut—it broke in half. In the days following, the helicopter blades and one of the tow truck cables broke off, but Genghis didn’t mind much. They’re still helicopters/tow trucks to him. After we finished cutting, I wanted to get a good picture showing the cutouts, so we got out a big sketchpad to use as a white background. The sketchpad made Genghis think of drawing, so we grabbed some colored markers. While I took care of a few other laser cuts (for work), he mapped out a small town, with roads, mountains, buildings, and oceans. Then he drove his trucks all over. He also insisted on drawing windows on both sides of every vehicle. In his mind, they weren’t done until they had windows. How many windows does a limo have, really? As a plaything, the trucks have been a success. Genghis’ almost-three-year-old sister plays with them as a kind of puzzle. She likes fitting the trucks back into the board and seeing them pop into place. 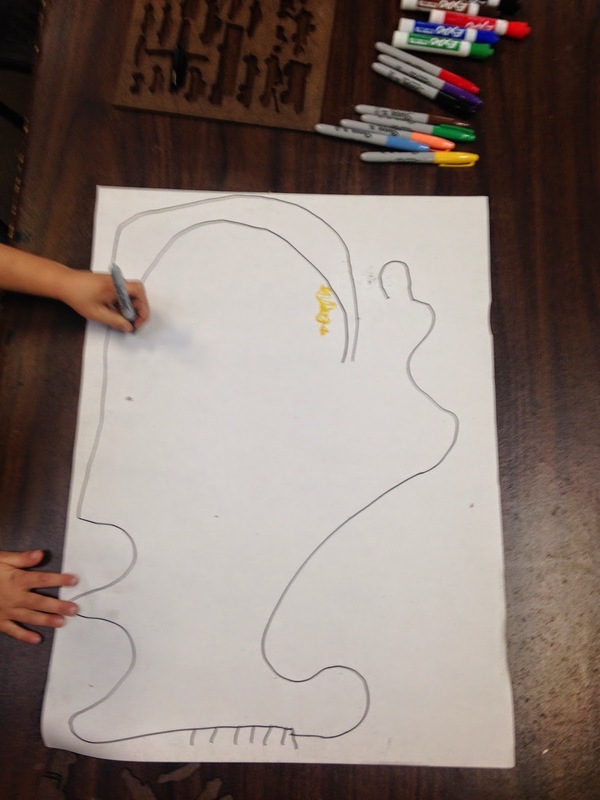 They’re small enough to challenge her fine motor control, and matching the shapes—especially all the similarly shaped cars—requires her full concentration. Genghis has been more interested in driving the trucks around and telling stories about what they’re doing together. 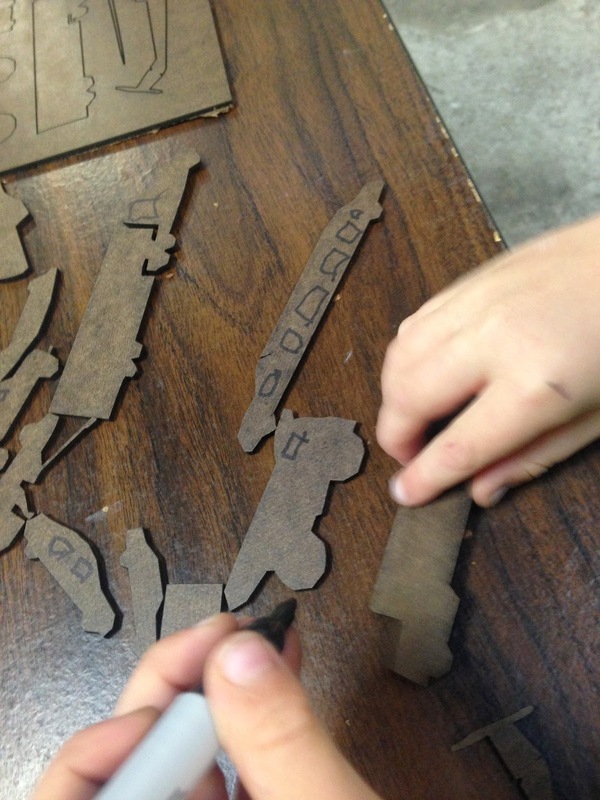 Later in the week, I’m also planning to show him how to use the holes in the board as stencils. He loves drawing, so I figure that will capture his interest. PS: If you know of good software for quickly generating silhouettes (vector or raster), please let me know—it’d be a great way to set up a creative pipeline for this kind of thing.